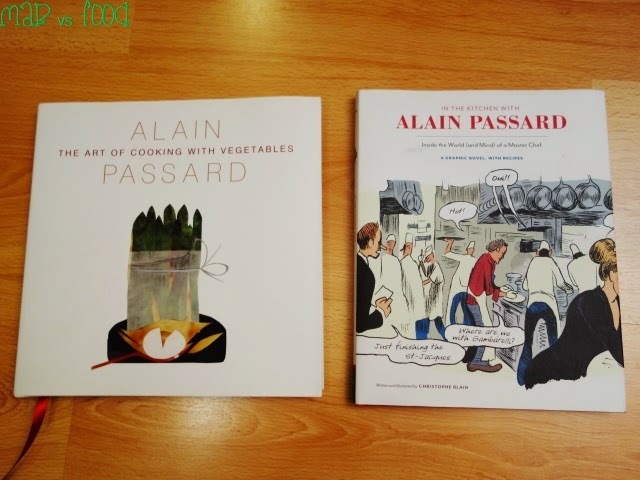 The Art of Cooking with Vegetables & In the Kitchen with Alain Passard - both are great reads! My dear readers, today I would like to tell you about one of the best meals of my life; this was at L'Arpége in the 7th arrondissement of Paris back in October last year. The chef patron at L'Arpége is Alain Passard. Passard is considered to be one of the great current chefs in Paris - alongside Alain Ducasse, Guy Savoy and Pierre Gagnaire. As you can see probably tell, I am bit of an Alain Passard fanboy! So much so that I booked my meal at L'Arpége 10 MONTHS in advance, before making any other travel arrangement! Being married to a vegetarian has changed me in many ways, not least making me more appreciative of the humble vegetable. I am practically a vegetarian at home now, having ditched steaks for roast vegetables. But unfortunately, vegetables are often overlooked and underutilised in restaurants. 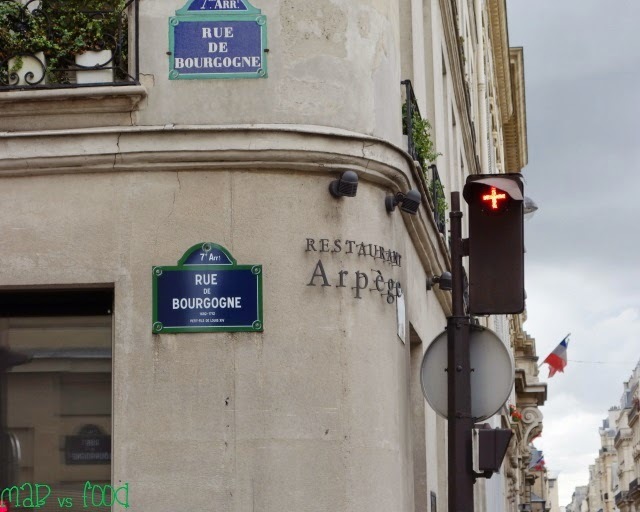 This is where L'Arpége comes in, which is widely considered to be the temple of vegetable gastronomy. L'Arpége is a 3-Michelin star restaurant and the highest ranked Parisian restaurant in the San Pellegrino World's 50 Best Restaurants List at number 25. 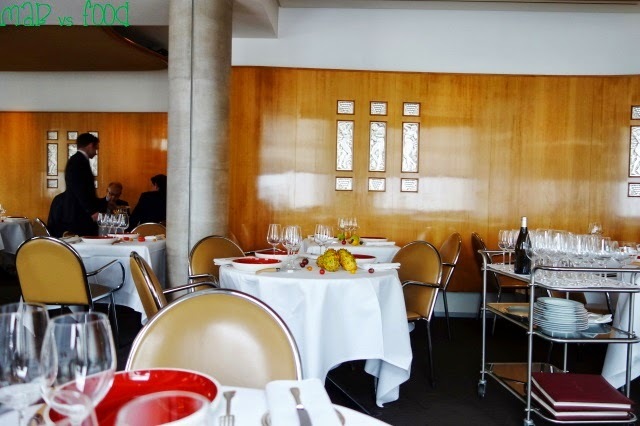 Ironically, Passard was once regarded as the best rôtisseur in France until in 2001, he decided to eradicate all red meat from his menu and dedicate himself to cooking with vegetables (following the outbreak of mad cow disease and his own boredom with cooking red meat). He put everything on the line with this move, including his 3 Michelin stars. Definitely a gutsy move, but obviously Michelin didn't mind as L'Arpége has retained all of its 3 stars since. 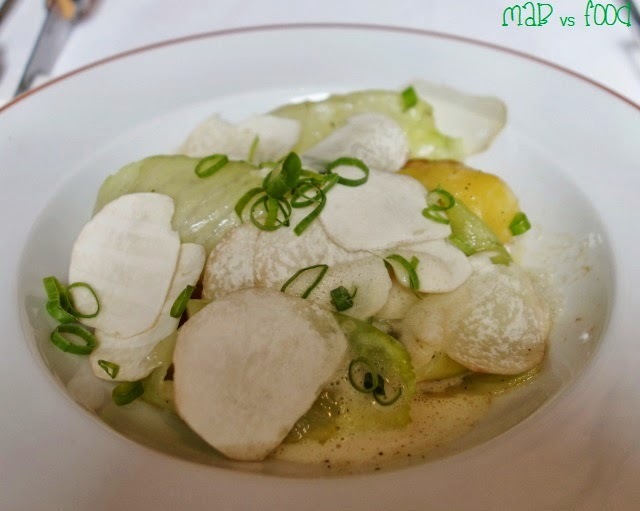 There is no doubt that the vegetables at L'Arpége are the freshest you will find in any restaurant in the world. Fruit and vegetables are picked daily and shipped to the restaurant from one of Passard's three biodynamic vegetable gardens in Sarthe and Normandy. 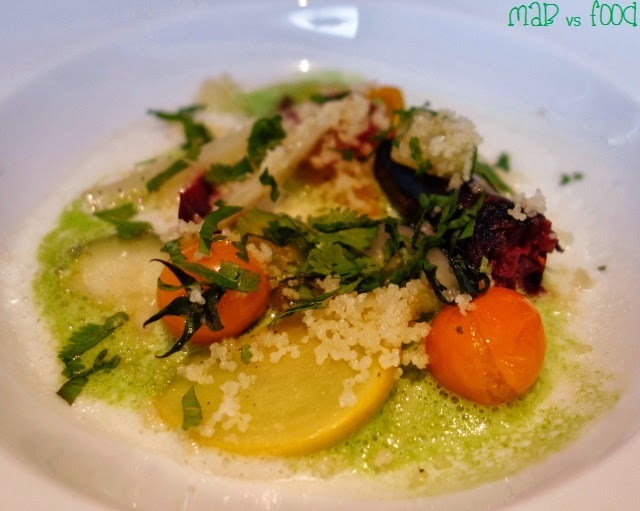 L'Arpége is not strictly a vegetarian restaurant, as seafood and poultry feature on the menu, but it is clear that vegetables given that extra-bit of special attention. L'Arpége is probably the most expensive restaurant in Paris, where dinner could set you back 380 euros! This was obviously a bit outside my budget (maybe another day! ), so my wife and I decided to dine at L'Arpége during the lunch service. We had the gardeners lunch menu, which was an 8 course menu that showcased the best of Passard's in-season vegetables. The lunch menu was priced at 135 euros, whilst not cheap by any means but a relative bargain if you consider the price of the dinner menu. 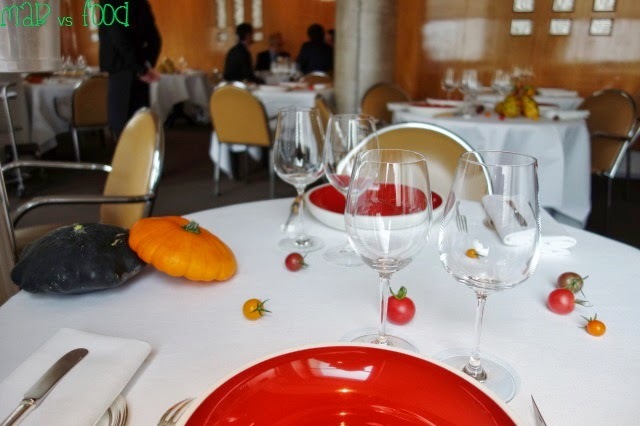 The dining room is simply decorated, with tables placed quite closely together. The room is carpeted with some wood panelling along the walls. 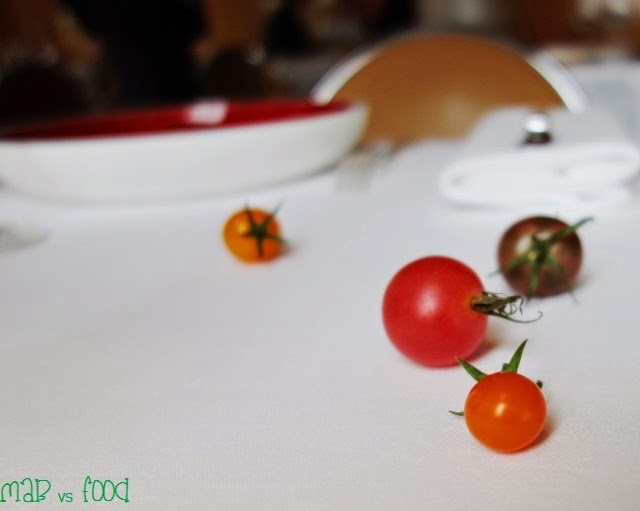 Each table is decorated with cherry tomatoes and different whole vegetables from Passard's gardens. Not long after we were seated, who else but the man himself, Alain Passard, emerged at our table to welcome us to his restaurant and to have a brief chat with us. This is a man that knows how to work a crowd; he was full of energy, charisma and enthusiasm as he dropped by each table during his 'rounds'. He even practically sat on the lap of a lady that was celebrating her birthday to pose for a photo. What a lucky lady LOL! One thing that I loved about my meal at L'Arpége was that I knew I would actually be eating Alain Passard's food. Unlike other famous chefs such as Heston Blumenthal and Gordon Ramsay, Passard has just one restaurant, so he spends most of his time in the kitchen. Well hello there, delicious little tomatoes! Our waiter informed us that we were free to consume the cherry tomatoes scattered over our table, not that we needed this invitation given both my wife and I are addicted to tomatoes. These tomatoes were superb and bursting with flavour, like no other tomato I have ever eaten! I knew from this moment, that the quality of produce at L'Arpége is second-to-none and that this meal was going to be epic! 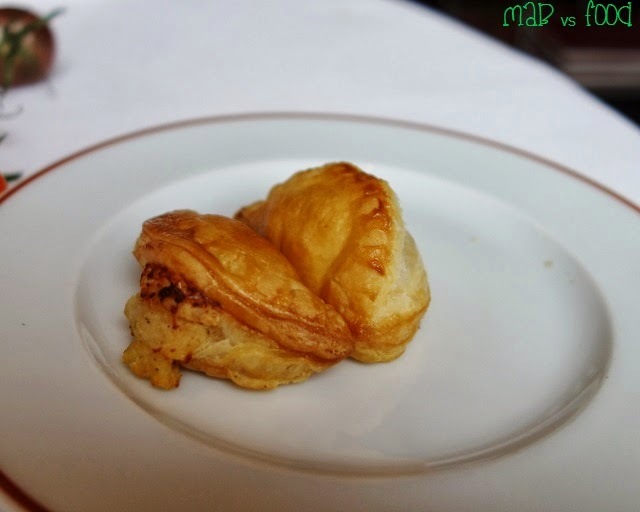 To start off this culinary journey, we were treated to a simple, little puff pastry filled with cabbage. The pastry was served warm straight from the oven and were just exquisite, so flakey and buttery. It was a shame that these vegetable puffs were bite-sized. I would happily devour plates of these! 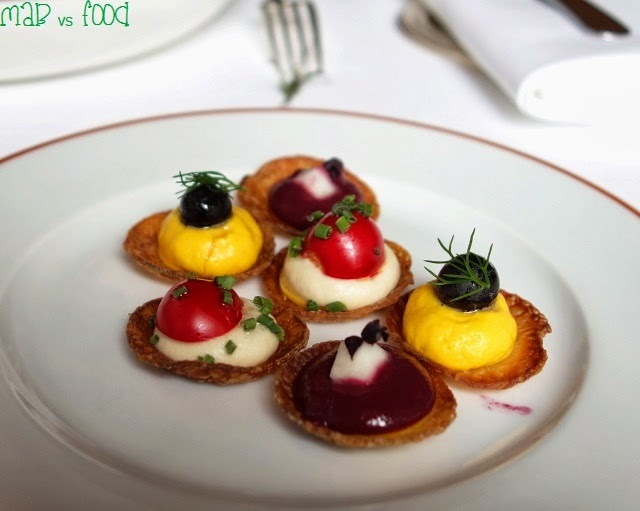 Next to arrive, were a trio of Alain Passard's signature vegetable tartlettes, which came as crisp, delicate discs of pastry each holding a different vegetable puree. 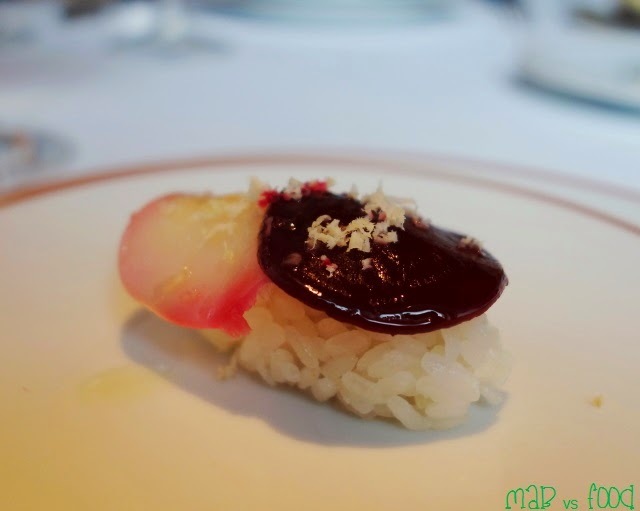 There was a carrot puree served with a blueberry and a sprig of rosemary; a celeriac and parmesan puree with a sliced tomato and chopped chives; and a beetroot puree with a cube of white beet and purple basil. My favourite was the beetroot tartlette, which had a wonderful earthy and smoky flavour. These were impressive little snacks to start the meal and again showcased the brilliance of Passard's vegetables. The first course of the tasting menu was tomato gazpacho with mustard seed ice cream. 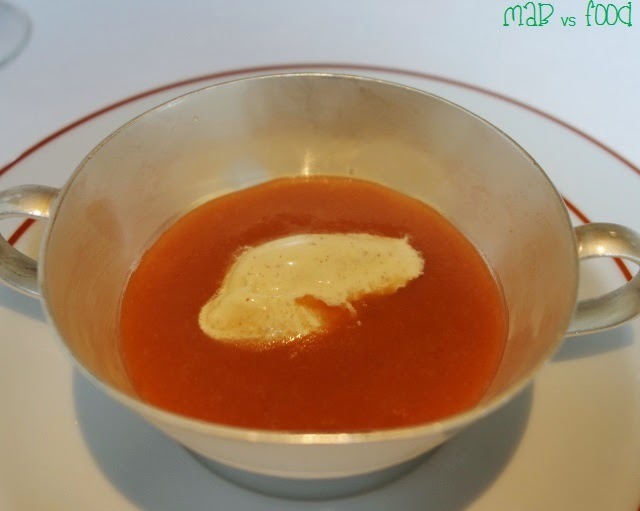 This gazpacho had me wondering how L'Arpége coaxes so much flavour out of simple tomatoes. The gazpacho was refreshing and so incredible. The mustard seed ice cream went remarkably well with the gazpacho. There was a nice amount of spice in the mustard seed ice cream and it added a great depth of flavour to the dish. This was a seemingly simple dish that got me really excited! We were then served a thick, chunky slice of sourdough bread. 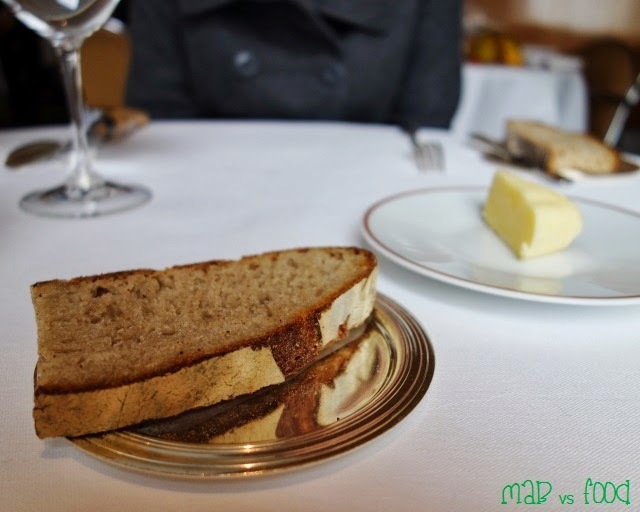 There was no doubt that the bread served at this 3-Michelin star restaurant would be excellent. The bread was soft, fluffy in the centre with a nice, robust flavour but it was the crust that was the highlight. The butter from St Malo in Brittany is some of the finest butter you will find anywhere in the world. Bread was constantly topped up throughout the meal, so you need to be careful not to fill yourself up with too many carbs! Another little snack arrived at our table: a beetroot sushi. The rice was fluffy yet still retained some bite. Draped over the rice was a slice of white and ruby beetroots. The flavours were fresh and pure, seasoned with only a bit of soy sauce, fresh horseradish and perfumed with gernium. The second course, 'Mesclun de Sylvian', is easily the best leaf salad that I have ever eaten. 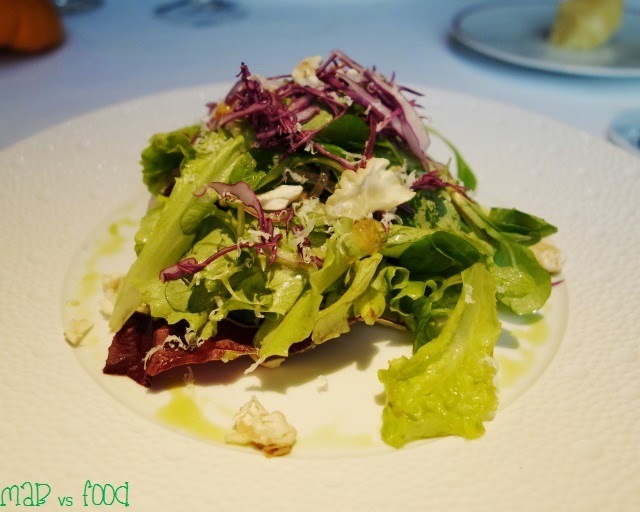 This was a super-fresh salad of crisp mixed leaves (none of which I have ever heard of) that have been selected by Alain Passard's head gardener, Sylvian Picard. The leaves were combined with horseradish, tomatoes, a wonderful almond praline and a drizzle of herb oil. The salad was perfectly seasoned with fleur de sel and soy sauce. A simple, yet extraordinary course! Here's another dish that wasn't listed on the menu, a colourful tomato carpaccio with paper thin slices of three varieties of tomatoes, purple basil and drizzled with extra virgin olive oil. 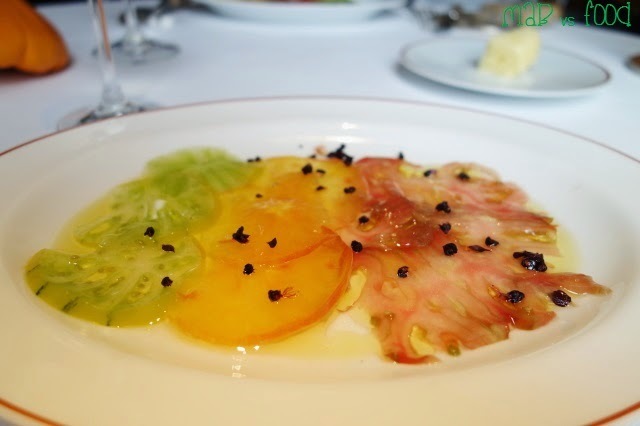 This tomato carpaccio is probably the dish that best expresses Alain Passard's food philosophy. A strikingly simple dish with few ingredients, yet the flavours were intense, interesting and thought provoking. There is absolutely nowhere to hide with food with so few elements, every component needs to be perfect and they were! I have already said enough about the tomatoes at L'Arpége (which Alain Passard growns 60 to 70 varieties of at his gardens, by the way). The flavour of the purple basil was extraordinary and the extra virgin olive oil was best I have had. 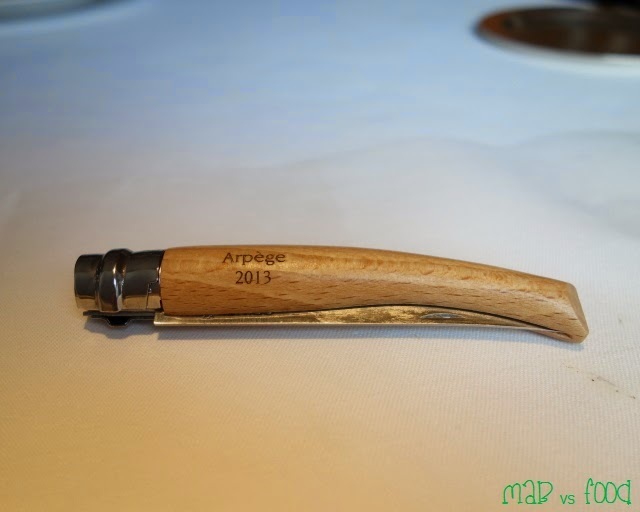 A highly memorable course and one of the highlights of my dining experience at L'Arpége. 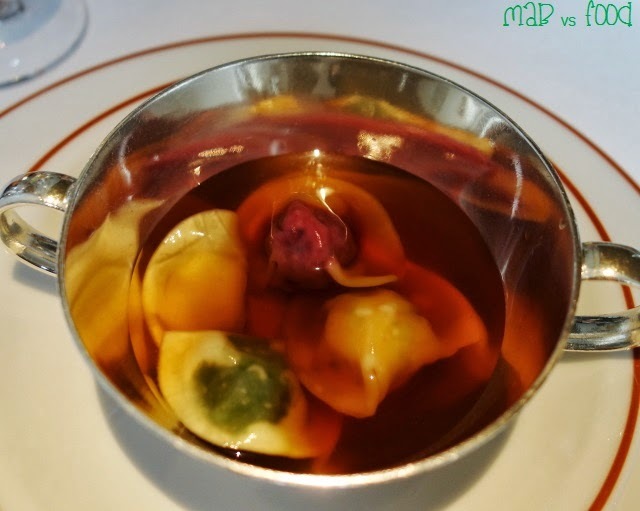 Third course was ravioli of vegetables submerged in a vegetable consommé. 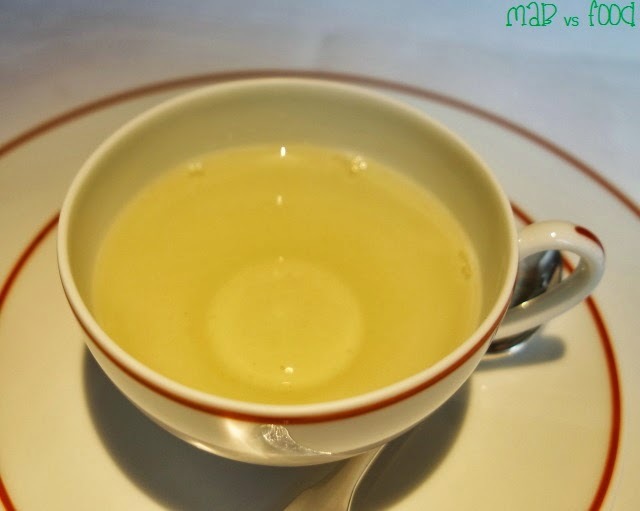 The first thing I noticed was the stunning purity of the flavours in the consommé; I could taste the very essence of vegetables. The pasta was probably the best I have encountered at a restaurant. The texture of the pasta was just perfect: the raviloi were like slippery wonton wrappers that were so silky and had a heavenly mouth-feel. Wrapped inside were some stunning finely diced vegetables.Yet another remarkable dish that I will remember for years to come! The next course, onion gratin, was another remarkably simple dish that blew me away. A thin layer of red baron onions were caramelised, bringing out the amazing natural sweetness of the onions. The gratinated parmigiano reggiano was a lovely golden brown, crisp and the flavour was out of this world. This was wonderfully balanced by the acidity of the chopped sorrel and the zestiness of orange blossom. 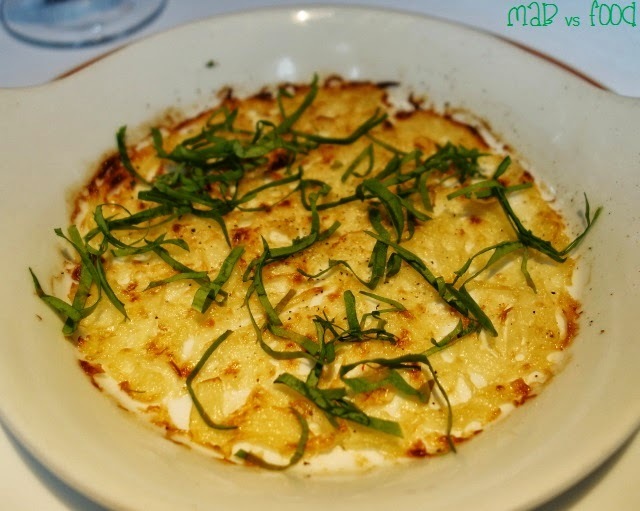 The onion gratin was then followed up with a harlequin's garden of vegetables. As colourful as a harlequin's outfit, this dish paired flavours from Moroccan cuisine with local vegetables (including golden globe turnips, beetroots, tomatoes, zucchini flowers, kohlrabi, and celery). For an extra textural element, the vegetables were mixed with couscous and a nutty argan oil. The vegetables were also accompanied by an impressive vegetable sausage, which was vegetarian except for the sausage skin. The filling of vegetables and spices was remarkably similar to a normal meat sausage. This was another dish that showcased the quality of L'Arpége's vegetables with flavour pairings that serve to enhance their natural flavour. For the last savoury course, I was given a choice between 'scales' or 'feathers'. 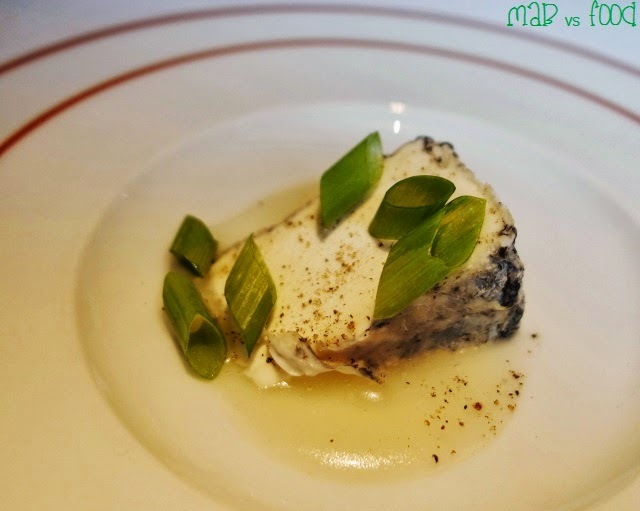 I opted for fish due to my preference for seafood but if I had my time again I might have chosen the chicken, which is cooked in hay at L'Arpége, an Alain Passard signature; I do have some regret that I didn't get to try L'Arpége's famous chicken. But having said this, the fish was one of the best I've ever had (yet again). 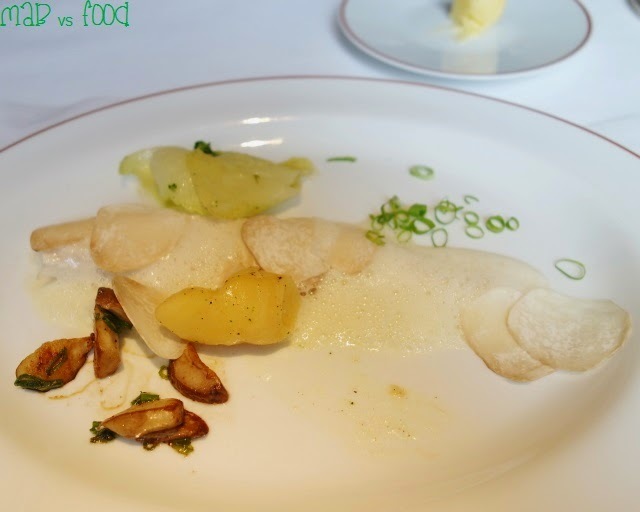 Hiding underneath discs of finely shaved cep mushrooms, was a long strip of perfectly cooked sole. The sole was so moist and delicate and prefectly complimented by a warm, buttery yellow wine sauce that was just incredible. Sharing the plate with the fish were smoked potato, cabbage, chives and some beautifully sauteed cep mushrooms. My wife's final vegetarian savoury course was essentially my dish with the sole removed and the quantity of vegetables upsized. She seemed to have enjoyed her dish just as much. Next was the cheese course. We were served a slab of Sainte-Maure goats cheese with geranium, shards of eschalots, and a dressing of honey, lemon and olive oil. The goat's cheese was undoubtedly of high quality but I felt the eschalots were too chunky to enjoy with the goats cheese. And for dessert, we had L'Arpége's famous apple tart, presented as a bouquet of roses. The bouquet of roses is the creation of a genius, so much so that Alain Passard decided to patent it! The bouquets are rolls of finely sliced apples topped with a berlingot crystal, which are bound together by a shallow dish of puff pastry. Words cannot begin to describe how amazing this tart was. The apples were so delicious: warm, firm in the middle and lightly stewed on the bottom. The puff pastry was flakey, buttery and moreish. 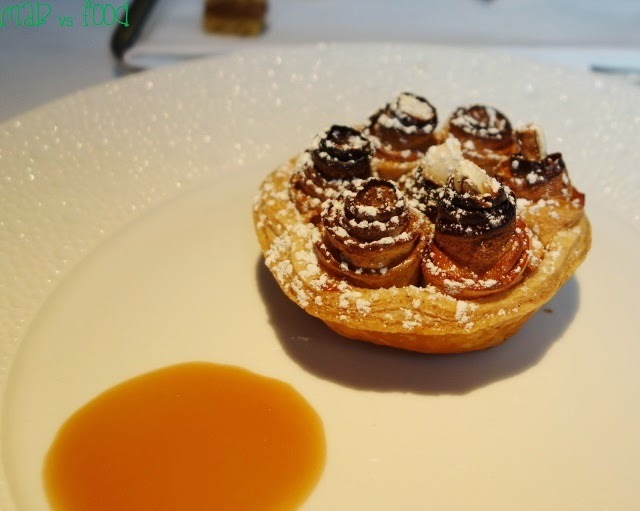 The apple tart was served with a puddle of wonderful caramel sauce. Best apple tart ever and what a fitting end to one of the best tasting menus I have ever had! We were then brought out a tray of petit fours at the conclusion of our tasting menu. There was a salted caramel corn cake, a tuile with rosemary, fruit jelly, blackberry macaron and an apple bouquet. We also had some tea to aid digestion. This was a house blend tea of mixed herbs and flowers from Alain Passard's garden. It was smooth, minty, refreshing and aromatic. 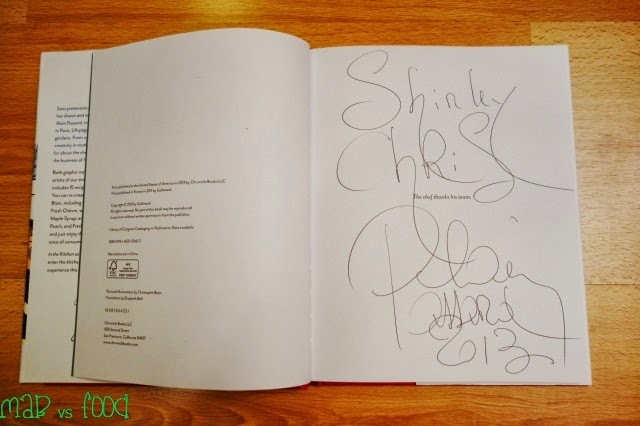 We decided to wait around for Alain Passard's final 'rounds' at the end of lunch service, as I wanted to personally thank him for the meal and to ask for his autograph. As we waited, a waiter brought out another tray of petit fours, which I thought was nice of them. But as soon as we finished this tray, another full tray appeared on our table! 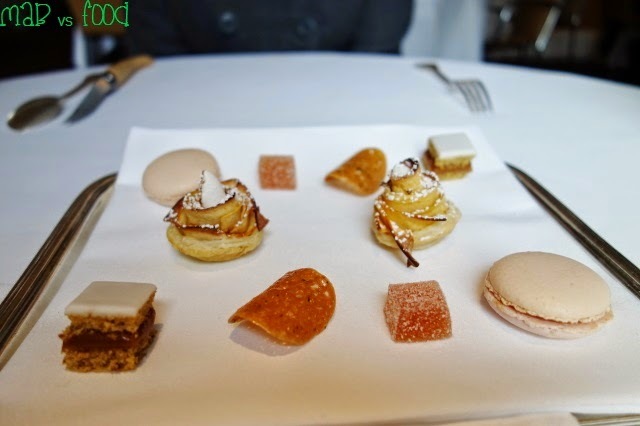 It became evident that even petit fours get topped up at L'Arpége. As delectable as these little treats were, it was too much for my stomach to handle! By the time Alain Passard emerged from the kitchen, at least half the guests had already left. Even after a busy lunch service, Passard was still full of energy. He was a gracious host as I used every single superlative I could think of to describe the meal. After he asked us where we were from, he responded “Ah Sydney, I have never been”. After I suggested that he needed to visit the beautiful city that I call home, he inquired whether I could cook for him, to which I could only laugh awkwardly. I would love to, but be careful with what you wish for, Mr Passard! I look back at this meal with fond memories; one of the best meals of my life for sure. I had just witnessed something that I have never seen at any other restaurant. The cooking at L'Arpége is so simple and minimalistic, with many of the dishes containing only a few elements. Yet the food was dynamic and complex, with clever flavour pairings that brought out the natural flavours of vegetables. It was like I had just be taken to vegetable heaven and it was one heck of a gastronomic experience! Highlight: Vegetables at their finest. I never knew vegetables could taste this good! Lowlight: L'Arpége is one of the most expensive restaurants in Paris, the price you pay for dining at the restaurant of a true genius.